It works right? I’m out of ideas for what to do for Wednesdays so here we go. 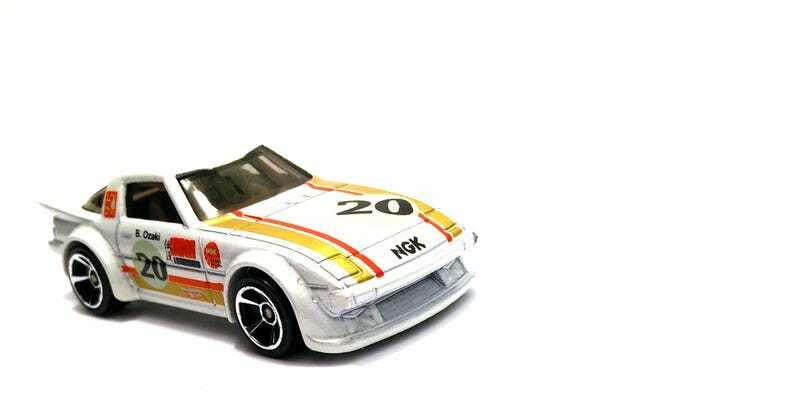 This is the first edition release of HW’s Mazda RX-7 in white. It’s a Kroger exclusive and came in those baggies with a round peep hole so that you can easily tell what model you get. It might be the best mystery model batches ever, as there was also a yellow Lamborghini Aventador in the mix. I found a ton of both at a Ralph’s near my school at the time, and they were even discounted to 50 cents a piece. However, I only grabbed one of each for my own collection. The first edition is still, by far, the best release of this car that HW has done. The livery is colorful yet realistic, and works really well especially on the black version. I’ve also seen the 1:1 that was created to match this diecast model, at JCCS. I’m not sure where that photo is, but one day I’ll dig it up and show it with the black model. I think the black is still the nicest, because this white one has paint flaws that are clearly visible. The paint is too thin on the creases and panel lines and some areas of the car end up looking grey. Other than that, it’s a fantastic, somewhat rare, model that all your RX-7 fans need to have.